Autumn season is marked by a range of characteristic objects. Can your first grader identify those objects? Download JumpStart’s ‘Autumn Season ‘ – a free, printable seasons worksheet to find out! 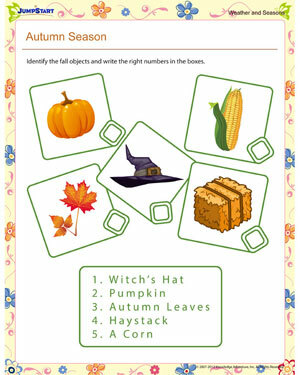 Here, the little ones will learn to identify fall objects as well as learn their spellings. Want more of our weather and seasons worksheets for kids ? Browse now!